Owing to its brightness and large apparent size, the full moon is an easy, favorite target for budding lunar photographers. Authors Imelda Joson and Edwin Aguirre captured this cropped view of the full moon with a Canon EOS 20D digital SLR camera at the prime focus of a Takahashi FS-78 refracting telescope (630 millimeters in focal length). The exposure time was 1/1250 second at ISO 200. Shooting the moon is fun, easy and very rewarding. This is because the moon is so bright and appears so large in the sky that even a small telescope can reveal a lot of interesting surface details. Today's digital single-lens reflex (DSLR) cameras, when used in conjunction with a telescope, will enable you to take stunning portraits of Earth's only natural satellite. You'll be able to capture not only countless impact craters of all shapes and sizes across the lunar landscape, but also craters with bright ray systems, towering peaks, jagged mountain ranges and dark, relatively smooth regions that early observers thought to be lunar "seas." You can also use your telescope setup to document the moon's changing phases, which occur each month as the satellite goes from crescent to quarter to full and back to crescent. You can even record the moon's earthshine and conjunctions (close groupings) with planets, as well as partial and total eclipses. The result is souvenir photos of memorable lunar events that you can proudly display in your home or office, or enjoy sharing with family and friends. There are basically three ways to photograph the moon through a telescope — shooting at prime focus, using eyepiece projection and using the afocal method. Below, we will give an overview of each technique, so you can try it out on the next clear night. To attach your DSLR camera (without the lens) to the telescope's eyepiece focuser, you need a T-ring that matches to your particular camera's lens mount and a prime-focus adapter (lower right) with male T-threads and a standard 1¼-inch barrel that can be inserted into the focuser. You'll also need an electronic "cable release," or remote trigger/controller (lower left), so you can operate the camera shutter while minimizing vibrations. Imelda Joson and Edwin Aguirre use a custom-made, machined-aluminum adapter to attach their DSLR camera to the Takahashi FS-78 refractor. This is the setup they used to obtain many of the moon photos accompanying their article. The size of the lunar image in the camera frame will depend on the focal length of the objective (front) lens in refracting telescopes and on the primary (main) mirror in reflecting telescopes. To get dramatic close-up views of the moon, you'll need a telescope with a focal length of 500 millimeters, or greater. A 500mm telescope will yield a lunar image that's about 5mm across in a DSLR camera with a full-frame, 35mm-format sensor; a 1,500mm telescope will produce a 14mm image, and a 2,000mm telescope results in an 18mm image. With consumer DSLRs that use smaller APS-C sensors, the lunar image will appear larger because of cropping of the camera frame. To obtain sharp images of the moon, focus your telescope/camera combination as best as you can. Many DSLR cameras offer "live-view" mode, which allows you to see what the camera sensor sees through its built-in LCD screen. You can zoom in on the image at up to 10x magnification to refine the focus. In this cropped photo taken by Imelda Joson and Edwin Aguirre on February 20, Venus appears as a brilliant "star" on the left, with dimmer Mars above it. Note the nice "earthshine" illuminating the moon's dark side. Although the trio looked close together as viewed along our line of sight, the celestial bodies were actually situated far apart in space. Venus was 134 million miles from Earth at the time, while Mars was 203 million miles away. The moon was much, much closer — a "mere" 225,000 miles away. Imelda and Edwin used a Canon EOS 5D Mark II DSLR camera at the prime focus of a Takahashi FC-60 refractor to capture this winter scene. The greatest advantage of digital cameras over film for shooting the moon is that you get instant feedback. What you see on the LCD screen is exactly what you get. The key is to "bracket" your exposures, that is, shoot as many images as you can, using various exposure settings. This way, you'll increase your chances of catching some really good shots. For example, if you photographed the full moon with a short-focus telescope at an ISO setting of 200 and a shutter speed of 1/1,000 of a second and the resulting image looks washed out (overexposed), try increasing the shutter speed to 1/2,000, or faster. If the image looks dim (underexposed), try decreasing your shutter speed to 1/500, or slower. You can also adjust the ISO sensitivity, decreasing it if the image is overexposed or increasing it if it is underexposed. Don't be afraid to experiment; just keep on trying different exposure settings until you obtain the result that works for your particular setup. This method is used to capture highly magnified views of lunar mountains or individual craters. To accomplish this, you'll need to add an eyepiece in between the camera body and the telescope using a special adapter tube, which holds the eyepiece in place. In addition to the T-ring, for the eyepiece-projection method you'll need a special adapter tube (shown at lower right) that holds the eyepiece in front of the camera. Be sure to securely lock the eyepiece in place inside the tube with the thumbscrew to prevent it from falling out and damaging your camera mirror and/or sensor. Some adapter tubes, like the one shown in the photo, allow you to vary the size of the moon's image on the sensor by adjusting the position of the eyepiece inside the sliding tube. The configuration will enable you to double or triple the image scale, depending on the focal length of the eyepiece used and the projection distance between the eyepiece and camera sensor. But the downside is that it's going to be more challenging to focus the telescope since the resulting image is going to be quite dim. You'll also need to compensate for the decrease in image brightness by extending the camera's exposure time or boosting its ISO sensitivity accordingly. Imelda Joson and Edwin Aguirre were able to zoom in on the moon's surface by switching the eyepiece in their Takahashi FS-78 refractor from 18 mm. to 7.5 mm. This close-up view of the moon's rugged, densely cratered southern highlands, along the terminator or boundary of the moon's day and night sides, features the 225-kilometer-wide Clavius (largest crater at far left). To its lower right is the crater Maginus (163 km), partly hidden in shadow. The smooth, dark lunar "sea" below right of center is called Mare Nubium (Latin for "Sea of Clouds"). At such image scales, any vibrations will be highly magnified, too. To minimize camera shake, be sure to mount the telescope on a sturdy tripod or base. You can reduce vibrations even further by locking the DSLR's viewfinder mirror up and using an electronic "cable release" to operate the shutter button. A good alternative would be to use the camera's built-in delay timer to open the shutter. At very high magnifications, even the motion of the moon across the sky can smear the image during a long exposure. That is why, in this situation, it's best to use a motor-driven equatorial mount for your telescope setup. You can use this method if you can't remove the lens in your camera, as in the case of pocketsize "point-and-shoot" cameras and smartphone cameras. First, aim the telescope at the moon. Then, with a low- or medium-power eyepiece, adjust the telescope focuser until the lunar image appears sharp. Once the telescope is focused, simply hold the camera directly into the eyepiece and use the camera's built-in LCD screen to compose the shot. Imelda Joson shows how the afocal projection technique is done using an iPhone 6 and the Swarovski spotting scope, which is actually a small, portable refracting telescope. This is the exact setup that she and Edwin used to capture the accompanying photos of the first-quarter and waxing gibbous moon. While hand-holding the camera up to the eyepiece, try to keep the camera as steady as you can. This is harder than you might think, so prepare to be disappointed with your initial results. Just keep on taking test shots until you get it right. If you're using a regular camera tripod, the moon will drift steadily across the telescope's field of view as the Earth rotates, so you only have a half minute or so to take the shot. Then you'll have to re-adjust the telescope to keep the moon aligned with the eyepiece and camera. While hand-holding will give decent results, you can obtain better, more consistent images if you buy a commercial bracket or adapter from camera retailers or online stores (just Google "digiscoping," which is another term for afocal photography). If you're handy with tools and machining, you can make your own custom mount. Whatever your choice, make sure the bracket or adapter will hold the camera securely to the eyepiece. By using the afocal configuration, it's possible to take stunningly detailed close-ups of the moon using ordinary compact "point-and-shoot" cameras and smartphone cameras. Imelda Joson and Edwin Aguirre snapped this view of the first-quarter moon on July 24 using an iPhone 6 handheld to the eyepiece of a tripod-mounted Swarovski 80-mm spotting scope at 60× magnification. If you see vignetting, or darkening around the edge of the image, that means the camera is positioned too far from the eyepiece. To reduce or eliminate vignetting, move the camera as close to the eyepiece as possible while keeping the camera centered. You can also increase the size of the lunar image by switching to a high-power eyepiece or using the camera lens's zoom feature. You can leave the camera in autofocus and auto-exposure modes when taking images, or if you prefer, you can adjust the settings yourself (check the camera manual on how to do this). There are third-party apps for smartphone cameras you can purchase that will let you control the exposure and edit the photos. No matter how precisely focused your telescope is or how good the quality of your telescope optics is, the sharpness of your lunar images will always be at the mercy of turbulence in the upper atmosphere. Atmospheric turbulence, which causes stars to twinkle, is the bane of all lunar and planetary photographers, since poor "seeing" conditions can render fine surface details into a boiling, roiling mess. So if parts of your images look fuzzy or distorted, it could be because of bad seeing. Your best option would be to photograph the moon when it's high in the sky and to keep on shooting in the hope that you might capture an image during that fleeting moment when the atmosphere is steady. Good luck, and clear skies! 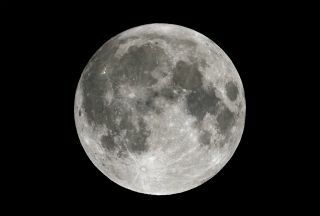 Editor's note: If you capture an amazing photo of the moon that you'd like to share with Space.com and its news partners for a story or gallery, you can send images and comments in to: spacephotos@space.com. Veteran astrophotographers Imelda Joson and Edwin Aguirre have been photographing the moon for more than three decades, starting with Kodak Tri-X black-and-white film. Follow us @Spacedotcom, Facebook and Google+. Original article on Space.com.